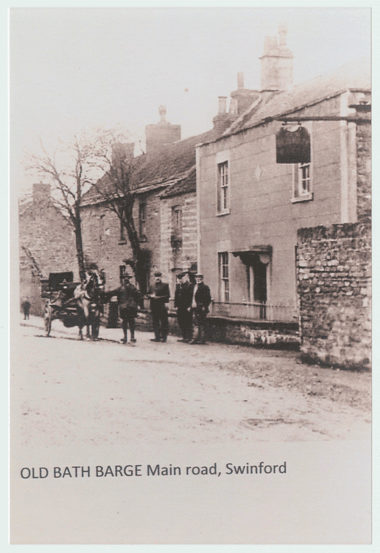 Welcome to the website of Bitton Parish History Group. One of our main aims is to preserve and make accessible our rich local history. 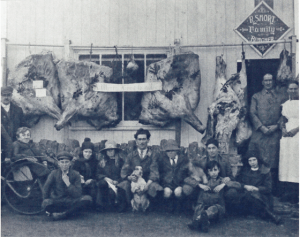 We are please to have your contributions to the site on articles about Bitton, North Common, Oldland Common, Swineford, Upton Cheyney, Beach and Willsbridge. John Cennick: The forgotten Kingswood Evangelist – John Cennick’s local preaching led to cultural and social changes that we can relate to today. 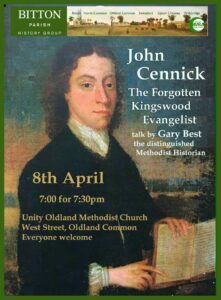 Gary Best will return to Unity Oldland, Methodist Church, West Street, Oldland Common on 8 April. 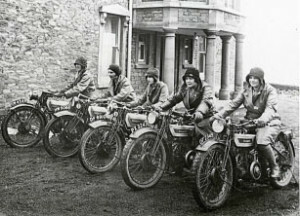 Bill Douglas introduced us to the history of the world-famous Douglas motorbikes. First manufactured in Kingswood from 1907, some 25000 were constructed for military use in the First World War. As well as Bill’s highly entertaining talk we also saw the fine display of historic Douglas bikes at Kingswood Museum. Eighty of us packed North Common Village Hall for a wonderful film made by David Noble and his friends Steve and Sue Brown. All eyes were glued to the screen, where so many old friends, neighbours and family told the story of Oldland Common since the 1940s. The evening was bursting full of anecdotes about school life, the local shops, pubs and sports. 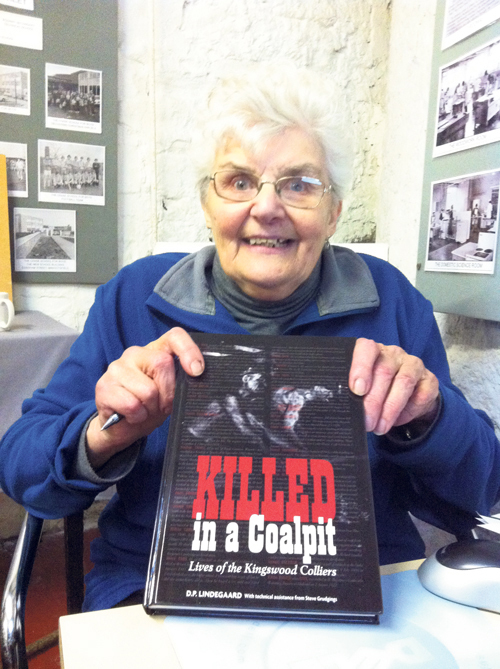 Doreen Lindegaard showed us a fascinating but sometimes macabre history of local coal mines. Her talk ‘Killed In a Coalpit’ provided an insight into the miners’ lives and the dangerous world of coal mining. Doreen has scoured newspaper reports, church and coroner’s records to find out more about some of the names whose deaths are recorded alongside the single line ‘killed in a coalpit’. At our visit to Kingswood Heritage Museum 23rd May we were treated to a fascinating evening, a relaxed atmosphere and a warm welcome. Alan Bryant highlighted some of the remarkable displays. We focused on local buildings with highlights being Kay’s explanation of the changes to the thatched cottages of Upton Cheyney, Penny Deverill’s slides of ‘The Checkers’ pub and No.46 School Road, and a huge display of local historic photos provided by David Noble. Our speaker was Shirley Hodgson, who has written and talked extensively on the subject of the vagrant children of Bristol. Shirley told us about the children who were orphaned, or abandoned locally and left destitute on the streets in Victorian times. Some were fed and educated by charities, churches and industrial schools, but many were left impoverished in workhouses, reformatories or on the streets. Shirley also told us about the work of Mary Carpenter, the Ragged Schools and the industrial schools that were set-up in the 1850s. Gary Best talked about ‘The Social Impact of Methodism on Bristol in the Eighteenth Century’. Gary Best is a well-known historian and writer, has written extensively on the history of Methodism and is a former Head of Kingswood School. 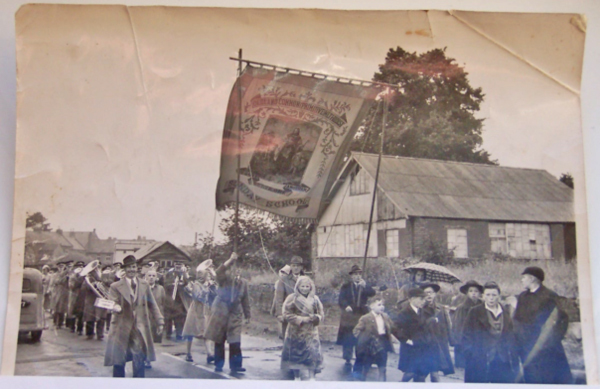 In the eighteenth century our local area, around Kingswood, was known for lawlessness and rebellion and yet one hundred years later it was described by the historian Abraham Braine as a peaceful, orderly place with hard working, contented inhabitants. It cannot be a coincidence that Methodism, among other non-conformist religions, had become widespread as the religion of local people. 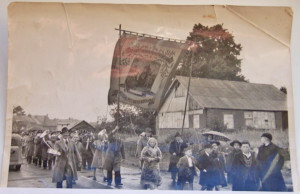 It was at nearby Hanham Mount that the powerful orator and preacher George Whitefield famously spoke to the local coal miners, in the open air, in 1739, and started what was to become a profound effect on the character of local people, as Evangelism spread across the west of England and Wales. Tony Roberts of Archeoscan, explained how a dig had originally started in 2012 with digging test pits, which revealed the corner of a building, thought to be 3rd Century. 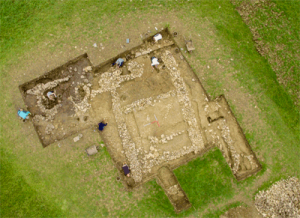 After carrying out magnetic imaging surveys, the work was continued in 2015 and revealed the lightweight foundation of a building and a series of bakery ovens and quernstones. At the same dig, painted plaster and pottery imported from southern France, indicated that there was a more significant building nearby. Intriguingly, a massive boundary wall was uncovered, some 2 yards wide, suggesting the site was either a villa, a public space, such as a temple, or a fortress. The archeologists were eager to continue the work this year, despite being severely hampered by bad weather. Further work showed that the lower terrace they had worked on was indeed an industrial working area with a bakery, iron working, pin manufacture, and the splitting of sandstone. Then came a breakthrough just two weeks ago, when, as well as lots of interesting pins, bowls, coins and other artefacts, a piece of carved monument, possibly the corner of an alter stone was found. Then a few days before the dig was due to finish, some pink (ochre) painted wall plaster, a mortar floor and what is possibly a bath house was found. We are very grateful to Tony Roberts and also to David Hawking for hosting us so well at Manor Farm, as well as giving his permission for the archeological dig. Many thanks to Adam, Bel and Penny for a very informative and enjoyable evening about Rebecca Worlock, Rebecca murdered her husband in 1820, by mixing poison in his beer. She was hanged for this crime the same year, in Gloucester Gaol. Bel now lives in the house where Rebecca was born and raised and offered her own thoughts about the story which haunts her more and more. Penny Deverill kindly shared so much of the research she carried out for her book ‘Two Penneth of Poison’. Adam generously showed his much acclaimed short film about the trial.